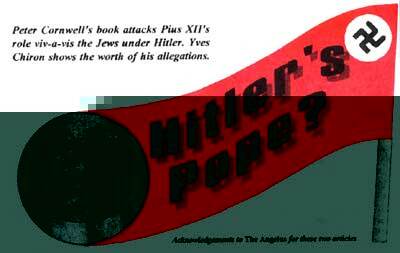 Peter Cornwell’s book attacks Pius XII’s role vis-a-vis the Jews under Hitler. Yves Chiron shows the worth of his allegations. John Cornwell’s new book, Hitler’s Pope,1 has been promoted by a massive international media blitz. It claims to tell “the secret history of Pius XII,” and to show that he went so far as to keep “silence” about the genocide perpetrated against the Jews during the World War II. Simultaneously translated in several countries, this book is a weapon in the war to block the beatification of Pope Pius XII, and, at the same time, to oblige the Church to repent yet again for its so-called “silence” about the genocide of the Jews. It is true that the author cannot be reproached for not consulting the archives of Pope Pius XII’s pontificate (1939-1958). They are still not open to researchers. However, on the subject which forms the principle concern of the book, that is, Pope Pius XII’s attitude towards Nazi Germany, an exhaustive series of documents has been available since 1965: Acts and Documents of the Holy See During the Second World War, in 12 volumes, published in French by the Vatican. Cornwell knows of the existence of these documents but he scarcely uses them, mentioning them only seven or eight times. Perhaps it was a lack of mastery of the French language that led him to neglect this excellent primary source. It is a legitimate point to raise, because the author cites almost no French works, and very few in Italian, even though in both of these languages important studies have appeared on the subject. The author’s sources are especially English. In any case, by not exploring Acts and Documents as he should have, he has passed by information essential to the question he examines. He overlooks, for example, the letters addressed by Pope Pius XII to the German bishops between 1939 and 1945. In these letters he would have found what was the actual frame of mind of Pius XII, anxious to act in a manner that would protect the Jews while still not aggravating the life and death situation faced by German Catholics. The only primary sources, unknown and unedited, to which Cornwell had access, were certain elements of the dossier for Pope Pius XII’s beatification. He drew from them judgments and anecdotes about Pope Pius XII’s personality, but nothing that sheds new light on the subject. In general, the historical affirmations of Cornwell are often questionable. How can Cornwell, or anyone for that matter with a minimum of theological and historical culture, assert as he does that, “The ideology of papal primacy, as we have known it within living memory, is an invention of the late nineteenth and early twentieth centuries” (p.3)?2 (Cornwell even sets off this preposterous statement in italics!) And only an English journalist could assert that “Papal autocracy undoubtedly had been a principal cause of the Reformation itself” (p.5). It is absolutely foolish for Cornwell to assert that European writers, thinkers, and politicians like “…Bovio in Italy, Balzac in France, Bismarck in Germany, Gladstone in England” had the conviction “that the papacy, and Catholicism with it, had had its day” (p.15). A second “proof”: In 1918, when Pacelli was still at Munich and the city was in the grip of an attempt Bolshevik revolution, an assistant of Pacelli, Msgr. Schioppa, described the leader of the movement, Levien, by highlighting his Jewishness, and describing him as “pale, dirty, with drugged eyes, hoarse voice, vulgar, repulsive, with a face both intelligent and sly.” Cornwell sees in this description “… an impression of stereotypical anti-Semitic contempt” (p.75), and he links Pacelli to it since, even though he was not the author of the report, he sent it to Rome with his annotations, about which Cornwell tells us nothing. As for the attitude of Pope Pius XII during the World War II, Cornwell does not hesitate to be a loud mouth in his anathemas. Considering the genocide order by Hitler, Pope Pius XII, he says, “His complicity in the Final Solution through failure register appropriate condemnation was compounded by a retrospective attempt to portray himself as an outspoken defender of the Jewish people” (p.297). Confronted by the fate of the Italian Jews, it was hardly better, asserts Cornwell: “To his everlasting shame, and to the shame of the Catholic Church, Pacelli disdain to recognize the Jews of Rome as a part of his Roman flock” (p.318). Such bold assertions can only leave the reader flabbergasted. Cornwell does not hide certain initiatives taken during the war by the Church to come to the aid of the Jews, but he minimizes them and treats them as if Pope Pius XII had no part in them. However, the Acts and Documents already cited show very well that the interventions by the nuncios in Germany to facilitate the emigration of Jews, and in other countries of Europe (Slovakia, Romania, Hungary, and Croatia) to try and prevent the deportations, were made with the approval of the Holy See, and hence of the Pope. The abundant correspondence exchanged proves it. In conclusion, only one testimonial in favor of Pope Pius XII and his actions in favor of the Jews will be cited here, although many more could be. It comes from the Jewish historian Pinchas E. Lapide. At the conclusion of his extensive research in the vast archives of Jerusalem dedicated to the Holocaust, he published in 1967, a book called The Last Three Popes and the Jews. He claims that during the war the Holy See did more for the Jews than any other humanitarian organization, including the Red Cross. He estimates that 860,000 were saved, directly or indirectly, by Pope Pius XII. Editor’s Note: On the cover of the book Cornwell depicts Archbishop Pacelli leaving a German government building, guarded by two soldiers. This official visit of the then Nuncio took place not later than 1929, that is, four years before Hitler came into power (January 30, 1933). Since Pacelli left Germany in 1929 and never returned there, using this photograph is misleading and tendentious. Against this old and dirty trick protests were repeatedly published. The fact that a few months ago in a review in the USA Cornwell uses this photo on the cover of his book reveals from the outset his intention to denigrate the future Pope Pius XII. Yves Chiron, born in 1960, is a history professor and member of the Ecclesiastical History Society of France, he bas published numerous works on religious history, including biographies of Paul VI, Padre Pio, Pope Pius IX, and Pope Pies X. 1 John Cornwell, Hitler’s Pope: The Secret History of Pius XII, (New Yank: Viking Press, 1999). 2 For an historical review of the question, see the article by Matt Anger, “Catholics, Jews, and the Reich.” The Angelus, April 1997. 3 Rev. Fr. Paulo Dezia. “Le silence de Pius XII, ” Documentation catholique, July 1964. col. 1033-1034.